In celebration of Martin Luther King, Jr. Day in Larchmont and Mamaroneck, the community reflects on freedom and human rights and recalls their antithesis, slavery. As we reflect this year (2005), let’s remember Bet, Phelby, Candice, Nelly, Charlot, Jack, Hannibal, Telemaque, George, Lewis and Dorathea. They were slaves – not on a Southern plantation – but here in Mamaroneck Township, where slavery was practiced in the 1700s and did not recede until the 1820s. 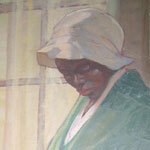 Another Delancey slave from Mamaroneck Library’s mural. Who were the enslaved people? The United States Census for 1790, identifies 57 slaves among the 452 people living in Mamaroneck Township. The census records include names of owners, but not of slaves. At the time, George Washington and Thomas Jefferson owned slaves, so it is not surprising that some of Mamaroneck’s leading citizens were slave owners as well. Gilbert Budd, who owned the most slaves between 1790 and 1810, had served with distinction in the Continental Army during the American Revolution and also served as the Clerk of Mamaroneck Township. Mary Palmer may have been a relative of Samuel Palmer, who purchased the area now known as Larchmont Manor. According to Larchmont Village Historian Judith Doolin Spikes, for a Palmer to be listed as a slave-holder is unexpected, because the Palmers were Quakers, who were opposed to slavery. The Allaires and their four slaves were neighbors of the Palmers. There are two people – Peter Jay Munro and John Peter DeLancey – who do not appear in the census as slave owners in Mamaroneck, yet appear in Township records where they report about their slaves. With this new act, it now became necessary to register the slaves born after July 1799 so it could be known when they were entitled to freedom. Mamaroneck Township records in 1799 duly started to include the newborn slaves’ names in the traditional manner of slavery — just the first names. Gilbert Budd, recorded the birth of Peg in 1800, daughter of his “black servant girl” Gin. Below is the list of each child born to a slave after July 1, 1799 as reported in the official Mamaroneck Township records. Considering that freedom was at stake, the records are remarkably informal. How much trouble would “Henry” have had establishing in 1828, after serving as a slave for 28 years, that he was the “Henry” in this record and was now eligible for freedom? When John D’Lancey registered a slave child in 1814, he wasn’t sure whether her name was Anne or Nancey. 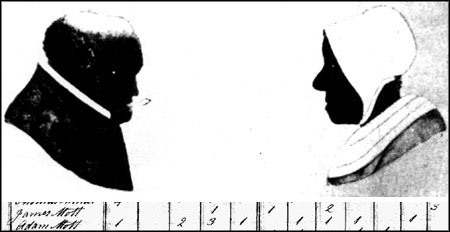 Twenty-five years later, when the child could have applied for her freedom, how would she have identified herself? The names on the list include a number of leading citizens. “John D’Lancey”, who was unsure of his slave’s name, was John Peter DeLancey (1753-1828), a Revolutionary War soldier and the father of William Heathcote DeLancey (1797-1865), a well-known Protestant Episcopal clergyman and provost of the University of Pennsylvania. DeLancey reported no slaves in his household in the 1810 census, but did report eleven “other free persons” – a category for non-white persons who are not slaves – sharing his home. This may be a recording error, or an intentional deception, since he regularly reported in Township records about his slaves. 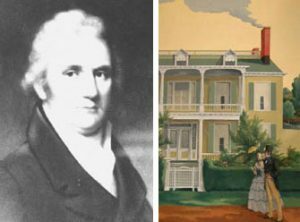 Peter Jay Munro kept at least 3 slaves at the Larchmont Manor House he built around 1797. Image of the house from a mural in Larchmont’s Library. Peter Jay Munro, owner of Nelly who gave birth to Charlot, was the original resident of the Manor House in Larchmont and a nephew of John Jay, the first Chief Justice of the United States Supreme Court. Munro does not appear as a slaveholder in the Mamaroneck U.S. Census in 1790. While he maintained his legal residence in New York City, and reported his four slaves to the census there in 1790, he recorded the birth of a child to one of his slaves in Mamaroneck Township in 1814. Starting in 1799, the Township records also began to include Certificates of Manumission that officially declared particular slaves to be free. In Mamaroneck, several slaves who were recorded in Township records as being set free, appear in subsequent census records. There is a Charles Johnson who appears in the “other free persons” category in New York City in 1810. Similarly, “Hannibal Lemmore” in Middletown, Connecticut is identifed as an “other free person” in 1810. He may be the “Hannibal” freed by Gilbert Budd in 1808. In her book, Images of America: Larchmont, Judith Doolin Spikes describes two former slaves named “Jinny” and “Banjo Billy” who had been owned by the Mott family and who continued to live at the Mott’s residence – the Mill House overlooking Red Bridge on Pryer Manor Road. “Banjo Billy” and “Ginny” with notes from the 1810 Census showing James Mott owned 3 slaves (“3” at right of table). From Adam and Anne Mott by Thomas Cornell, may be the only surviving images of slaves in Larchmont. In 1817, New York State took another step and granted freedom to all slaves born before July 4, 1799, which was to take effect on July 4, 1827. As explained by Douglas Harper in Emancipation in New York, the law had several huge loopholes. For example, it permitted part-time residents to maintain slaves for up to nine months of each year. Another loophole involved the children born of slaves after 1799. Consider the case of Peter Jay Munro’s slave Charlot born in 1814. She would be entitled to freedom under the 1817 law, but, according to the 1799 law, was not entitled to freedom until she completed 25 years of servitude, in 1839. Across the state, a more horrible problem was also taking place. Soon-to-be-freed slaves were being sold or kidnapped, and then taken to states where slavery continued to be legal. In any case, by 1820, the number of slaves in Westchester had declined to 205, and none were listed as living in Mamaroneck Township. The numbers in New York continued to dwindle: by 1830, of the 75 slaves in New York, none was from Westchester. By 1850, only 4 slaves were reported in all of the state. Appreciation is due to the Larchmont and Mamaroneck Public Libraries that provided assistance with research. This article was published first in the Larchmont Gazette, January 13, 2005.